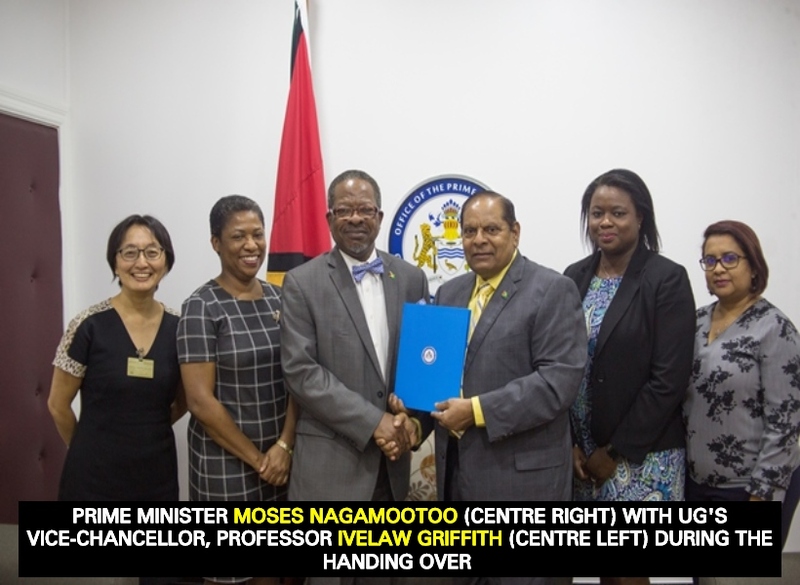 The Office of the Prime Minister (OPM) recently handed over $5M to the University of Guyana (UG) as funding for Constitutional Reform education. UG’s Vice-Chancellor, Professor Ivelaw Griffith received the cheque at the office of the Prime Minister. The Constitutional Reform Education programme is a collaboration between the Office of the Prime Minister (OPM), the United Nations Development Programme (UNDP) and the University of Guyana. Nagamootoo explained that constitutional reform is not for “sloganeering” nor should it be used as an electioneering platform. Politics, the Prime Minister noted, is often used as a purveyor of divisiveness rather than fostering unity, even in the case of constitutional reform, which should be seen as a good for the society. He then pointed to UG’s role in making the Constitution more relatable for the wider public. The OPM and UNDP have been working on the project document for some time and UG has been included at this juncture as education is part of its remit. UNDP Resident Representative, Mikiko Tanaka said that after a 2016 mission, it was determined that consensus across political parties and public education were the two pillars of constitutional reform. Professor Griffith noted his satisfaction with the university’s role in the process. Deputy Vice-Chancellor, Dr. Barbara Reynolds, said a survey and the education awareness programme will extend beyond the Coastland to ensure Guyanese from all regions are involved. As an extension of the Constitutional Reform Education programme, OPM will print 500 copies of the Constitution which will be handed over to schools and Toshaos across the country. This will be done before the close of 2018.